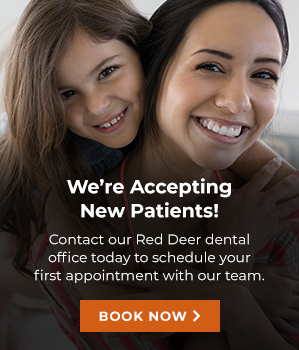 At Southpointe Dental, we offer traditional orthodontics such as braces, as well as Invisalign ® invisible braces to our Red Deer patients looking to straighten their teeth, correct their bite and enhance their smile. To ensure that your children develop a healthy smile, we offer comprehensive orthodontics & functional orthopedics to the children of Red Deer. Often, the first step to orthodontic treatment is functional orthopedics which involves using temporary oral appliances, such as retainers, to ensure their facial and jaw bones are developing properly. Successful orthopedics can prevent future complications, such as tooth overcrowding, TMJ, sleep apnea and poor sleeping habits. If required, we may recommend orthodontics, which involves placing braces onto the teeth to align them into proper position. Braces give the dentist more accurate control to ensure that your child achieves a healthy attractive smile. Depending on their case, orthodontic treatment can last for several years. We also offer Invisalign® invisible braces for our Red Deer patients looking to straighten their teeth. Invisalign® invisible braces use an advanced system of clear plastic aligners that work to shift your teeth into the right place. Each of the aligners is made of clear plastic so are extremely difficult to see when worn. Because each aligner is custom-made to your teeth’s measurements, they place an exact amount of pressure on your teeth to correct your smile during your treatment. This is possible to be achieved using technology, such as digital impressions and X-rays to create the exact shape for the aligners and your smile. With Invisalign®, you are able to continue smiling, laughing, and eating and know that others won’t be able to see them. In addition, since the aligners aren’t bonded to your teeth, they can be removed at any time. As a result, you will be able to brush, floss, and eat as you normally would. Invisalign® aligners are ideal for less complex dental and bite problems. Invisalign treatment time varies from patient to patient and can last anywhere from 3 months to 2 years. During your treatment, you are required to wear the aligners for at least 21 hours a day to ensure you are following your treatment plan. To learn more about orthodontic treatments or Invisalign, contact us at Southpointe Dental in Red Deer today!